Meatless, full of your favorite veggies, and delicious enough to be take-out, you’ll love this super quick and easy weeknight dinner! It’s been a heavy last couple of days. Even though we’re not living in Minnesota anymore, this most recent incident has seemed particularly close. The school where Philando Castile worked was right behind our duplex when we lived in St. Paul. We often would walk to the school’s park to hang out or play frisbee in the field. We would look at the produce that the kids at the Montessori were growing in their elementary garden. We played baseball a couple of times with kids in the neighborhood. We loved that area and the people who inhabited it. It’s all so confusing right now, but with pain comes community and love and I know St. Paul will be there for those who are hurting. Boil noodles according to package directions, then drain and set aside. 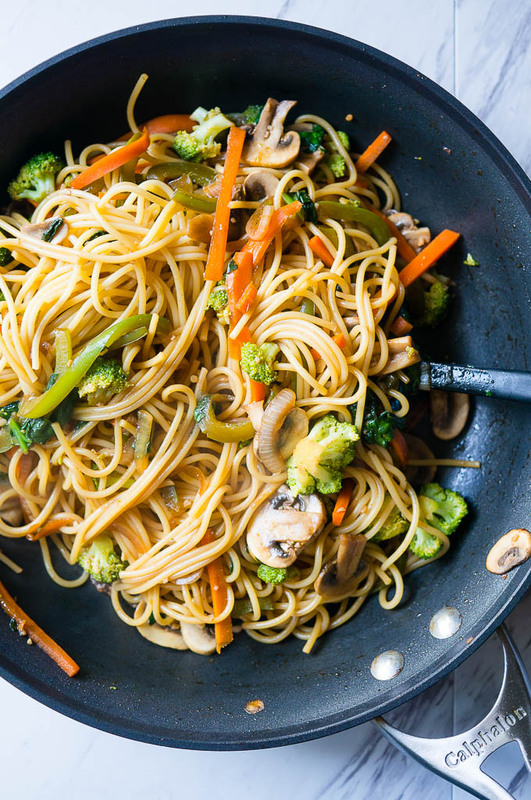 While noodles are cooking, heat olive oil in large skillet or wok over medium high heat. Saute garlic and onion together for 2 minutes, then add broccoli, bell pepper, and carrots. Saute for 4 minutes, then add in sliced mushrooms. Saute another 2 minutes. Whisk together all ingredients for sauce, then pour over top of vegetables, stir, then add in cooked noodles and toss to combine. 0 Response to "15 Minute Vegetable Lo Mein"